I'll do my best to not make this to cheesy (*snort* god, I'm awful). 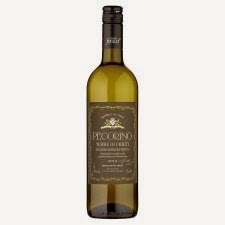 Basically, I've been drinking Tesco's Finest Pecorino - and yes I mean the wine and not the cheese. It's surprisingly pretty bloody good. Pecorino is a grape variety that is native to Italy (as well as a tasty cheese. Did I mention it's a cheese?) that is believed to have evolved from wild vines in the country. There are now about 87 hectares of Pecorino throughout Italy, most notably in Marche, Abruzzo, Tuscany and Umbria, although there are many other Pecorino-growing areas too. Tesco's Finest Pecorino comes from Abruzzo, a region arguably most famous for its red wine - Montepulciano d'Abruzzo - however the whites from Abruzzo are rapidly growing in popularity. I'm not normally one to buy wine regularly from most of the supermarkets and Tesco wouldn't always be my first choice, so I really was surprised at just how truly pleasant this white is. It has a nice, upfront nose of lime, stone fruit and flint, already much more complexity than I would have expected. As soon as I tasted it, I knew that it is an incredibly easy-drinking wine. In fact, it's so charming it would be far too easy to drink two whole bottles without realising and end up throwing up on your shoes... but, you know, let's not do that. Ever. The palate is very pleasant, with a zippy, refreshing acidity but also surprisingly full texture. The lime flavours continue through but are joined by lemon, pear drops and peach. This is a very upfront style, not exactly bursting with complexity, but if you're looking to expand your selection of everyday wines then you should seriously try this up-and-coming grape variety. Delicious description! for sure, it's worth trying.